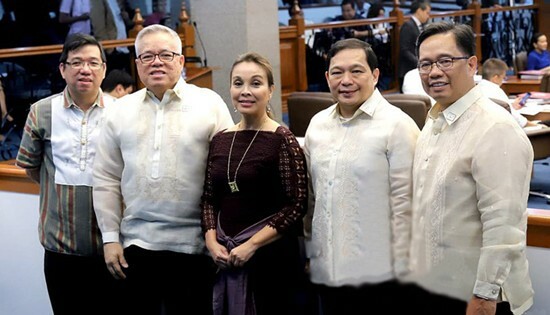 From L to R: Department of Trade and Industry (DTI) Undersecretary Ceferino S. Rodolfo, DTI Secretary Ramon M. Lopez, Senator Loren B. Legarda, Department of Foreign Affairs (DFA) Undersecretary Manuel Antonio J. Teehankee, and DFA Assistant Secretary Leo M. Herrera-Lim. PASAY CITY – Trade Secretary Ramon Lopez hailed the ratification of the Senate of the Philippines-European Free Trade Association Free Trade Agreement (PH-EFTA FTA) during its third reading last 05 March 2018. “The PH-EFTA FTA is in line with President Rodrigo Duterte’s strategy of pursuing trade relations with non-traditional as well as high potential trade partners. With this ratification, the Philippines will benefit from expanded trade engagements with non-EU members even as it gives us greater access to the European market,” said Sec. Lopez. The agreement will allow duty-free market access between the Philippines and the EFTA member states (Iceland, Liechtenstein, Norway, and Switzerland) to trade products and services and facilitate investments. The FTA benefits the PH especially in exporting agricultural, industrial, and fishery products. Once the FTA is in place, EFTA will grant duty-free market access to all industrial and fishery products from PH. PH will also gain tax incentives on agricultural products, particularly those (1) that are currently being exported to the EFTA Member States such as desiccated coconut, prepared or preserved pineapples, and raw cane sugar; (2) with high potential export interest, including those exported to neighboring European countries, which can be alternatively exported to EFTA countries. “This will improve the country’s market share vis-à-vis the other ASEAN countries in the EFTA market. The Philippines can take the opportunity to position itself as EFTA’s primary import source of these products,” said Senator Loren B. Legarda, Chair of the Senate Committee on Foreign Relations during her speech at the Senate last February 26. In return, PH will also grant EFTA countries duty-free market access on most industrial and fishery products as well as market access on goods such as temperate fruits, mineral and aerated waters, food preparations, chocolate, cheese and wine. The agreement will also welcome foreign investments on renewable energy, computer and related services (IT-BPM), construction, environmental services, maritime transport, and finance. Highly-skilled Filipino workers will also have easier entry in the 4 countries. The agreement allows temporary stay of the following service suppliers, without the need for an economic needs test: (1) executives, managers and specialists (who are intra-corporate transfers), (2) business visitors, (3) contractual service suppliers, and (4) installers of service industrial machinery. The PH-EFTA FTA will be effective three months after its ratification in PH and at least one EFTA member state. Once implemented, this is the Philippines’ second bilateral FTA after the Japan-Philippine Economic Partnership Agreement (JPEPA) in 2008.